TOLEDO, O.H. -- The University at Buffalo volleyball team closed out the regular season with its fifth straight win on Saturday afternoon as the Bulls came away with a 3-2 win at Toledo, clinching a bye in the upcoming MAC Tournament for the first time ever. With the win, UB finishes conference play at 10-6, setting a new program for MAC wins. Overall, UB improved to 18-10 on the year. The 18 wins have tied a program best since joining the league. Buffalo took the contest 25-14, 23-25, 25-14, 15-25, 15-13 as UB hit .223 for the match, opposed to .196 for Toledo. The Bulls raced out to a quick 7-1 lead in the opening set and extended their lead to 17-6 following a kill from junior Kristina Nieves. Back-to-back kills by junior Polina Prokudina put Buffalo ahead 21-11 and UB clinched the set following a Toledo attack error. Toledo tied the match up at 1-1 following a close 25-23 win in set two, but UB came out and dominated again in the third. UB opened the set on an 8-3 run, getting a pair of service aces from senior Larra Bickelhauptduring the run. 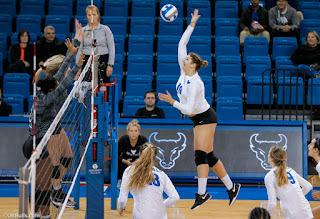 UB extended the lead to 12-4 following a Toledo attack error and following a pair of service aces from Andrea Mitrovic, the Bulls went ahead 20-11. The Bulls went on to clinch the set on a Mitrovic kill to take the 2-1 lead. The Rockets answered again though, taking the fourth set, sending the match into a fifth. Toledo jumped out to the 7-4 advantage and continued to lead 10-6 when the Bulls scored four straight points as a kill by junior Rachel Sanks tied it up at 10-10. The Rockets went back ahead 13-12, but that would be Toledo's final point as UB scored the final three of the night, clinched on a kill from Prokudina. Five Bulls scored in double figures in kills led by 17 from Prokudina, who hit .314, while senior Megan Wernette and Sanks each had 11 kills. Mitrovic and Nieves finished with 10 each as Nieves had just one error, hitting .562 for the contest. Sophomore Tia Gleason dished out 52 assists in the win, adding a kill, an ace and seven digs. As a team, the Bulls finished with eight service aces, led by three from Mitrovic. Defensively, Bickelhaupt had 21 digs against the Rockets, while Mitrovic added 17 digs and junior Hannah Watson had 12. The Bulls will now wait for the final standings to play out and see their potential matchups in the MAC Tournament. With a first round bye, UB will play its first match next Friday in the MAC Quarterfinals.